South Dakota is home to some of the most beautiful badland formations in North America. The Great Plains cover the western two-thirds of the state, and the Central Lowlands cover the eastern third. The Missouri River bisects the state, flowing south from North Dakota to Nebraska and forming the southeastern border with Nebraska. Many other rivers join the Missouri River, some coming from the west and others from the east. The James River has the distinction of being the longest non-navigable river in the world. The four largest lakes are reservoirs behind dams on the Missouri River. Two other large lakes form part of the border with Minnesota. Between 1–2 % of South Dakota (1,220 square miles) is covered by water. What is South Dakota’s maritime heritage? People moved into South Dakota at the end of the last Ice Age about 11,500 years ago. The earliest people specialized in big-game hunting while later people had a more nomadic hunting and gathering lifestyle. Beginning about 1,000 years ago, some people started farming and living much of the year in villages along the river valleys throughout the state. These people were displaced around 1750 when major groups of the Sioux Nation moved into the area. By the mid-1800s, the Sioux occupied the entire state. Euro-American fur traders may have entered the region in the late 1600s and early 1700s before Francois and Louis-Joseph de la Verendrye led an expedition and left a lead plate marker at a location near present-day Fort Pierre on the Missouri River in 1743. Euro-American contacts were limited to traders during the periods when France and Spain claimed the area and after the United States acquired it in 1803 as part of the Louisiana Purchase. In the decades following the Lewis and Clark Expedition, fur trading posts were established along the Missouri River in places like Yankton (1812) and Fort Pierre (1817). 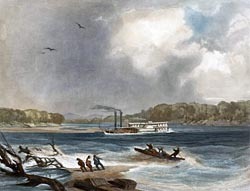 Keelboats provided the primary means of transportation until steamers like the Yellow Stone reached Pierre beginning in 1831. Fort Randall (1856) was the most southern in a chain of military posts established along the Upper Missouri River to maintain peace on the frontier and protect navigation. Settlement by people other than Indians was sparse until the 1870s following the Treaty of Fort Laramie, the arrival of the railroad at Yankton and Sioux City, the discovery of gold in the Black Hills, and post-Civil War homesteading. 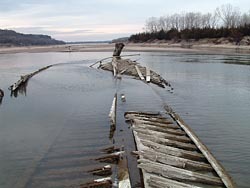 Hundreds of riverboats were lost on the Missouri River in the 19th and early 20th centuries because of snags, sand bars, rocks, explosions, fires, and ice. 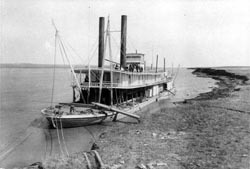 At least 30 steamboats were lost along the South Dakota shore after hitting obstructions, including the Kate Swinney in 1855, the Tempest in 1865, the Pocahontis No. 2 in 1866, the Urilda and the Bachelor in 1869, the North Alabama in 1870, and the Ida Reese in 1871. Steamers risked becoming entrapped and destroyed by heaving ice when traveling up the Missouri River too late in the year. This happened to most of the steamers on the river between Yankton and Vermillion during the devastating ice gorge in 1881. Examples of steamers destroyed by ice over the years include the Peoria Belle in 1865, the Imperial in 1867, the Sioux City No. 2 in 1873, the Western in 1881, and the Josephine in 1907. South Dakota’s artificial lakes contain the ruins of historic fur trading posts, military forts, and Indian Agency posts that became inundated when reservoirs were filled with water. With four large reservoirs on the Missouri River, some of the sites now underwater include Pierre Antoine Tabeau’s post, Fort Primeau, Fort Recovery, Fort Kiowa, Fort Lookout, Fort Sully, the Whetstone Indian Agency, the Grand River Indian Agency, and the Lower Brulé Indian Agency. Who takes care of South Dakota's underwater archeological sites? The South Dakota State Historical Society has overall responsibility for promoting, nurturing, and sustaining the historical and cultural heritage of the state. The Society accomplishes much of this work through the State Historic Preservation Office and the State Archaeological Research Center. The State Historic Preservation Office is responsible for surveying, identifying, recording, and evaluating historic properties, and nominating eligible properties to the National Register of Historic Places. The State Archaeological Research Center is responsible for investigating and protecting archeological sites in South Dakota, maintaining a database of information about known sites in the state, acting as a repository for archeological collections, and promoting awareness of the state’s archeological heritage. South Dakota has identified Missouri River navigation as an important theme of the state’s history. Historic properties falling into this theme include warehouses, riverboats, wreck sites, quays, and other shoreline facilities. Fur trading posts and military forts and encampments are other important historical themes associated with the Missouri River and other river valleys in South Dakota. The state also has identified prehistoric and historic period archeological sites associated with the Missouri and the Big Sioux Rivers as some of the most endangered significant property types. You need a permit from the State Historical Society to conduct an archeological survey or excavation on state lands or at designated state archeological register sites. Permits are issued to qualified applicants, and applicants must disseminate the project’s results for the public benefit. Objects removed from archeological sites on state lands remain the property of the state and must be deposited at a university, museum, or other scientific or educational institution willing to assume curatorial responsibility of the property on behalf of the state. Applications for permits are sent to the State Archaeological Research Center for review and processing. What laws concern underwater archeology in South Dakota? Laws about Archaeological Exploration are set forth in Chapter 1-20 of the South Dakota Codified Laws. Related laws are in Chapter 1-18 (South Dakota Historical Society), Chapter 1-19 (Historic Sites and Monuments), Chapter 1-19A (Preservation of Historic Sites), and Chapter 1-19B (County and Municipal Historic Preservation Activities). The state’s regulations about its Office of History are in Article 24:52 of the Administrative Rules of South Dakota. Chapter 24:52:08 covers Archaeological Permits and Chapter 24:52:06 covers the State Register of Historic Places.